Each student's number of correct answers. Average number of correct answers for the whole class. Percent correct on each question for the whole class. When you finish an activity, you will be asked if you would like to Get Reports. 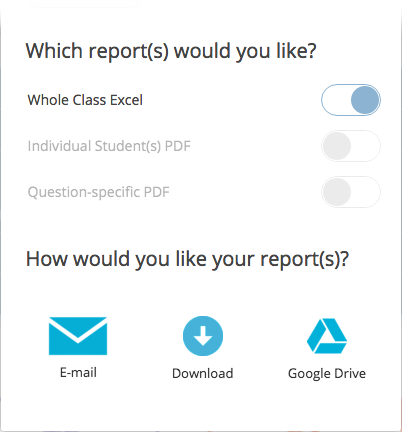 Click on Get Reports for some additional reporting options and select Whole Class Excel. Finally, decide how you would like to receive your reports (e.g. Email, Download, or Google Drive).